I don't always focus on hair too much on this blog. I'm actually pretty low maintenance when it comes to my 'do, but one item that I must pay attention to are my brushes. Brushes make such a difference with makeup, why not with hair? A representative from Brush Lab recently contacted me and offered me some brushes for review. He sent me three types to test. In my personal arsenal, I always have two types of brushes: one for detangling and one for blow outs. I was happy to see that I was able to try out brushes that did both. This first one is called Pretty Pink 2-in-1 Mirror brush. What a cutie! First of all it's hot pink - my fav! It's a flat brush with round, ball topped bristles. The space between the bristles is good for detangling. The best part is that the opposite side of the brush has a mirror. What a clever idea! 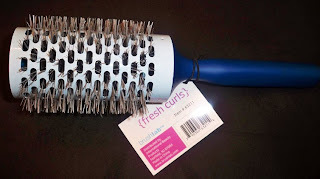 This is very convenient as a travel brush or to stick in your school locker or desk at work. I love multi-use products. Just make sure to not slam this down on a counter mirror side down...you don't want 7 years of bad luck! The other brush is round with snythetic bristles. 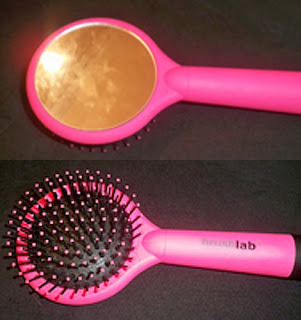 This brush is perfect for blow drying to get that fresh from the salon look. The barrell shape helps to curl hair under and provide volume. Due to the large size, this is better for medium to long hair. The cactus like bristles help to grip the hair so you can perform a blow out. When I want to take a few extra minutes with my hair, i'll whip out this bad boy and my blow dryer. My last brush has mysteriously ventured to the boyfriend's side of the bathroom. It's a flat brush with boar bristles. I love using this for smoothing out/finishing off my hair. The bristles help to distribute oil evenly throughout the hair, making it extra shiny. My boyfriend loves using it for his African-American textured, short hair. It smooths out his little coils and evens out the fade. There's also a nice rubber grip on the handle which makes handling a little easier. Haha, is it bad that I don't comb my hair? ohh I need those brushes! I didn't know how important they are til recently! I just came across you on youtube and subscribed right away ..I am so glad I did amazing info girl .and am now more aware of what brushes are necessary! :P Thanx girl ! You Rock !